Forçant la patience, a dessus moy pouvoir. Malheurueux qui se laisse à l’Amour decevoir ! Et d’un remede prompt daignez moy secourir. Vous n’aurez le Laurier pour l’avoir fait mourir. My Lady, I am dying abandoned by hope. Beyond bearing has such power over me. Unhappy he who allows himself to be deceived by love ! I am your Telephus, who is going to die of them. Deign to help me with a prompt remedy. You will not gain laurels for having killed him. That last couplet is rather fun: a twist on the usual ‘killing me’ line, pointing out that no-one gets honoured for killing their own servant … The poem as a whole is interesting partly for showing how far our modern perception of the classics is from that of the past: Achilles we share, but Telephus? The Trojan War is familiar to us, and the part of Achilles in it; and we are familiar with the ‘core’ Greek tragedies. But that the story of Telephus was a major preoccupation of the tragedians we are largely unaware – all three wrote (now lost) plays on the theme. And that familiarity with the tale extended to the renaissance, and not just in France: Shakespeare references Telephus in Henry VI part two. So who was Telephus? The son of Heracles , he was wounded by Achilles in a preliminary to the Trojan War ; the wound would not heal, but the Delphic Oracle told him “your assailant will heal you”, a line which obsessed the Greeks and Romans. It turned out that he was to be healed by Achilles’ spear, not by Achilles himself, and the weapon that hurts & heals became a popular theme with Roman poets – Horace, Ovid, Propertius and others all use it, often in this context of love poetry. Shakespeare’s use [Henry VI, Part 2, act 5.1.100–101] is witness to wider usage: “Whose smile and frown, like to Achilles’ spear / Is able with the change to kill and cure”. Ronsard’s classicism of course runs deep: I like the second stanza whose details map onto the Virgilian underworld depicted in the Aeneid. A fin de ne mourir pour tant de fois renaistre. Car soudain je retourne à r’engluer mon aile. Ne m’appellez donq plus dissimulé ne feint. Est le gage certain d’un service fidele. At every moment, and always everywhere pursue you. As a servant fears to displease his master. That I do not die to be reborn so many times. For suddenly I’d return and glue my wings again. So don’t again accuse me of deception or pretence. Is the certain token of faithful service. This is a much more straightforward poem than the last we looked at! Textually it still offers a few interpretative decisions (though textually there are no variants to report). The opening, for instance, could as easily read “If I am not going to nourish myself … [then] alas, pardon me”. But I prefer to treat the opening ‘si’ as an assertive, contradictory ‘yes!’ rather than an uncertain ‘if’. At the other end of the poem, the ‘gage’ in the final line could be a ‘guarantee’ rather than a token: your choice. The reference to glued wings is to the practice catching birds on sticky limed twigs: Ronsard here is the bird, once caught, who willingly comes back and is caught again. et gran tempo è ch’i’ presi il primier salto. lassando come suol me freddo smalto. fallir forse non fu di scusa indegno. fur de la mia fede non leggier pegno. And it’s a long time since I took the first step. Leaving me frozen like enamel. Perhaps I am not unworthy of excuse for my failing. Is no light token to my faithfulness. Renouvellant en toy d’Ortyge le renom. Qu’il te plaise estimer ma rude Poësie. Digne d’avoir autels, digne d’avoir Empire. Et le mauvais destin te fait present du pire. Renewing in you the renown of Ortygia. It pleases you to value my crude poetry. Worthy to have altars, worthy to have Dominion. And evil destiny made you the gift of a worse one. This poem offers a number of difficulties, which make it the more interesting: the thought is quite compressed in stanza 2, in particular. Petrarch is a ‘sonneur’, which is more ‘musician’ than poet; but once again it’s worth remembering that for Ronsard the two are closely linked. Only one tiny variant in Blanchemain, in line 9 ‘vertu‘ instead of the plural. Tu monstras qu’une mort tenoit ta vie enclose. Mourir puis que la mort te plaist sur toute chose. Mespriser les vivans est un signe d’orgueil. Je veux du tout mourir pour estre mieux aimé. You showed that the dead girl held your life prisoner. Dying – since death pleases you above all. But despising the living is a sign of pride. I’d prefer to die, that I might be better loved. It sometimes seems that you can hear real irritation in Ronsard. To me, this is one of those places: ‘yes, Helene, it’s all very well remembering the dead, but remember the living too’. Note that, in line 3, ‘eschauffer’ carries an implied meaning of ‘arousing’ as well as ‘warming’ – as if Helen could raise Lucrece from the dead. Richelet informs us that “this Lucrece was a girl from Bacqueville [Normandy], young, fair, learned, among the most perfect at Court, who was among Helen’s best friends”. Me dist en se jouant, Que vostre sang est noir ! De cuire de nourrir de faire son devoir. Et d’un nouveau printemps faites moy r’animer. Nul charme ne sçauroit renouveller la mienne. Si je veux rajeunir il ne faut plus aimer. She said in joke, “How dark your blood is! And make me live again with a new springtime. But no magic could renew mine. If I wish to become young again, I must love no more. Humours and bleeding – very sixteenth-century, not the medicine we know today. But all pretty elf-explanatory, I think. A couple of classical names that may not be so clear: Medea and Aeson. Blanchemain to the rescue: ‘Medea, who rejuvenated with her magic the aged Æson’. Aeson was Jason’s (aged) father and, when Jason returned from Colchis with Medea, she did indeed rejuvenate him – by slitting his throat and boiling him in a pot! Aeson emerged , youn g again. It was all a plot to get rid of Pelias who was threatening to oust Aeson: promising to rejuvenate him too, Medea killed and boiled him – but without bringing him back to life. Hence the references to blood, fresh and good, a new springtime, and magic. The names may also be familiar from a modern form of magic – Aeson is a parsing library for JSON (get it? ), and named from these myths. Vienne quelque marchand, je le mets à l’enchere. J’en feray bon marché. Ah ! j’ay trop attendu. Aussi fine que toy, de malice aussi pleine. Quand tu seras plus grand, tu me payras ma peine. Let some merchant come, I put him up for auction. I’ll sell him cheap. Ah, I’ve waited too long. See how he weeps, he’s understood me well. Who’s as delicate as you, and as full of wickedness. And when you’re older, you’ll repay my trouble. 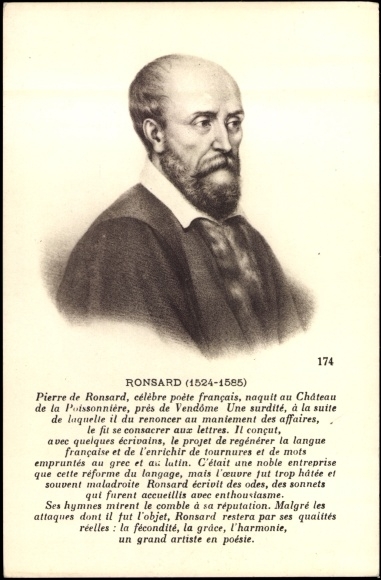 Even though Ronsard is classicizing, this is a reminder that slavery still existed: people really could be sold. Slightly unusual among these poems for pursuing one image all through the sonnet; Ronsard usually seems in these later poems to be throwing together several different thoughts or perspectives. There is a variant in Blanchemain’s edition: his line 3 reads “Il ne faut plus qu’il croisse ; il m’a desja perdu !” (‘There’s no need for him to grow up, he has already destroyed me!’) – the same thought in a slightly less-concentrated form. Je vy contre l’Hyver boutonner un Soucy. La neige est sur ma teste, et la sienne est gelee. Qui sert aux mesmes Dieux, comme aux hommes d’exemple. Vœuz encens et autels sacrifices et temple. I saw blossoming – in the face of Winter – a marigold. Snow is on my head, its own is frozen. Who provides an example to the gods themselves, as to men. Vows, incense and altars, sacrifices and a temple. The transition between the first stanza and the remainder is a bit rough: from the rarity of the flower in winter, and of love in old-age, to the rarity of Helen as a paragon of all virtues; and then in the final lines to the rather odd reflection on the wickedness of his own time. The latter is what we’d expect in a sonnet, perhaps, but the ormer jars a little. I really don’t think any commentary on the various goddesses in lines 9-10 is needed; for once, Ronsard explains himself thoroughly for even the classical novice. And Blanchemain has no variants to offer, either.